Last weekend, Maine escaped the wild storm that hit much of the Eastern Seaboard. The storm dropped freezing rain on North Carolina, where Shannon and Mike now live, and headed north to dump over a foot of snow in places such as New York City, where Dee lives. Then it went out to sea, leaving us unscathed. 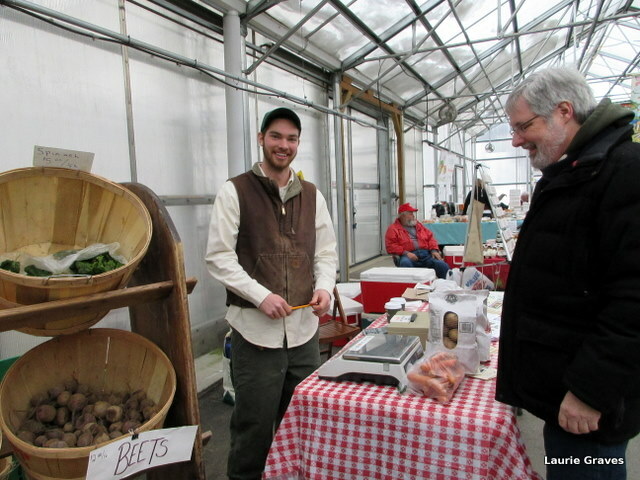 Therefore, on Saturday, we went to Longfellow’s Greenhouses for the winter farmers’ market they host from January 9 to February 27, from 9:00 a.m. to 1 p.m. 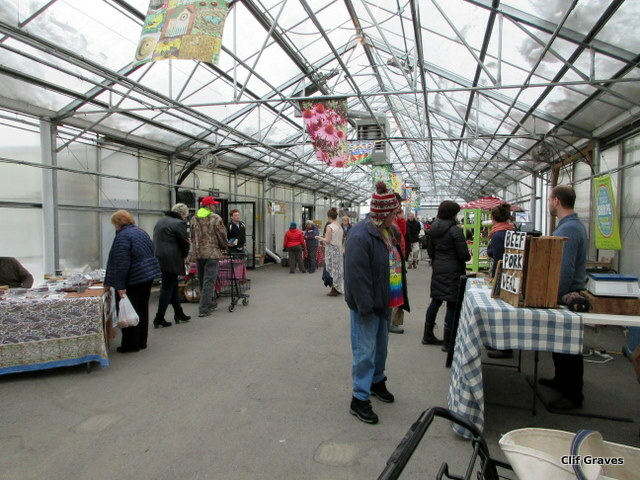 It is held in their “mall”, a long strip, covered like a green house, that connects the retail store to the actual greenhouses. We chatted with Farmer Kev for a bit, and we learned he has his very own farm now in West Gardiner. Quite an accomplishment for a young man who isn’t even thirty and who doesn’t come from a farming family, from whom he will inherit land. When we were done talking to Farmer Kev, we wandered up and down the mall, looking at the various products. 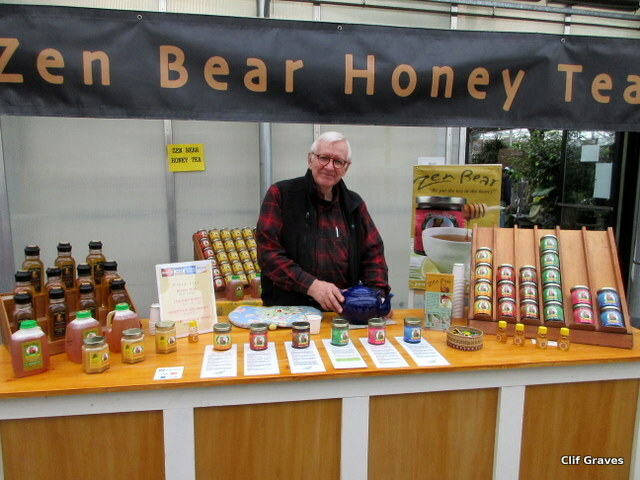 So many good things to sample and see, but we were especially taken with Zen Bear, which sells honey and honey tea. We talked with Frank Ferrel, formerly of Maine Public Broadcasting fame and currently one of the owners of Zen Bear. (He and his wife Lisa run the business.) He told us that the honey comes from Amish farmers in Aroostook County in Maine. 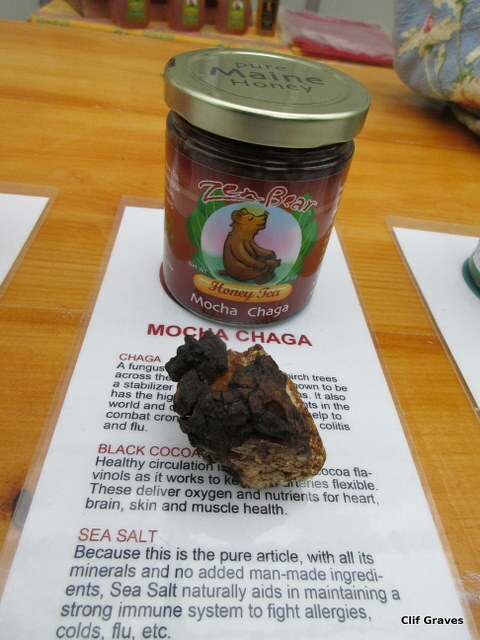 All right, so Mocha Chaga is exotic—for a Mainer—and high in antioxidants. But how does it taste? I am happy to report that it has the delicious taste of hot cocoa, albeit one that has unusual ingredients and is high in antioxidants. I bought a jar of Mocha Chaga and had a cup this morning for elevenses. It was very good indeed. Potatoes and carrots, honey tea made from chaga and lucuma. You never know what you’ll find at a farmers’ market. 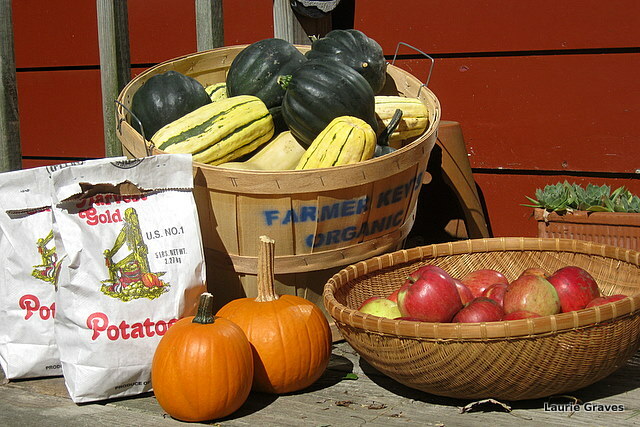 On this bright October Day, when the sky is deep blue and there is a nip in the air and there is no better place to be than Maine, I bought forty pounds of squash and ten pounds of potatoes from Farmer Kev. From beneath my friends’ apple trees, I gleaned nine pounds of apple. What a wonderful bounty! Next week, I’ll be stocking up on more of Farmer Kev’s vegetables. And, I’ve got a lead on where to glean some pears. Autumn is finally here, and how I love it. A week or so ago, when I was reading Gladys Taber’s Harvest at Stillmeadow, I came across one of her original recipes for a chicken casserole. 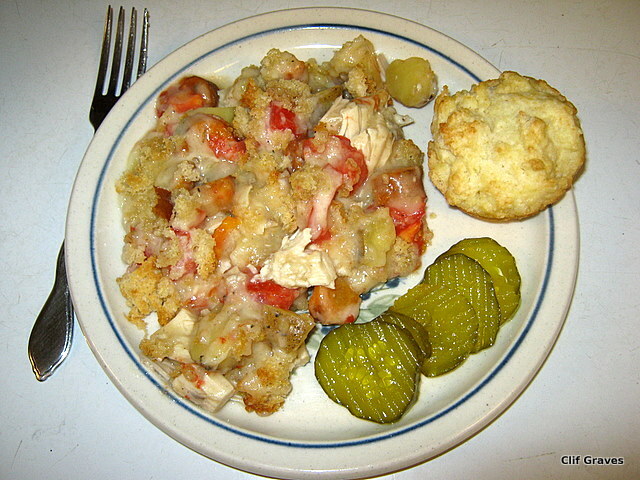 She listed the layered ingredients: Cooked chicken; carrots or peas; rice or potatoes; tomatoes; cheese; and bread crumbs. So far, so good. But then came the dreaded ingredient—canned cream of mushroom soup. I know. Gladys was a cook of her time, just as we are cooks in our own time, but canned cream of mushroom soup is a step back that I cannot take. My own mother was a fan of this canned soup, and although she was a a terrific baker, she used cream of mushroom soup with an alarming frequency in her main meals. Even as a child, I didn’t like it, and my heart would sink when I learned that dinner was another one of my mother’s concoctions, which all revolved around the canned cream of mushroom soup and usually had noodles, some kind of protein, and canned vegetables. The worst was ground beef, macaroni, Veg-all, and cream of mushroom soup. I can still picture it. I can still remember the taste. And it turned me off casseroles for a long, long time. Lately, though, I have reconsidered my anti-casserole stance. If they are made with real ingredients, say, a white sauce or a homemade gravy rather than a canned soup, then casseroles can be pretty tasty. They are also economical, using up the last bits of cooked chicken, carrots, and potatoes from a previous meal. So with Gladys’s recipe, I began to think about substitutions for the cream of mushroom soup. I could make a garlic and parsley white sauce, which is tasty over fish as well as a good binder for casseroles. Or, I could get clever and make a gravy from a stock simmered in a slow-cooker, leftover from a meal featuring chicken, potatoes, and carrots. If I were really clever, then I could cook extra vegetables and have pretty much everything I needed for the casserole the next day. And that is exactly what I did. On one day, I cut up plenty of Farmer Kev’s carrots and potatoes, and filled the bottom of the slow-cooker, taking care to leave enough room for the little chicken, which weighed about four pounds. 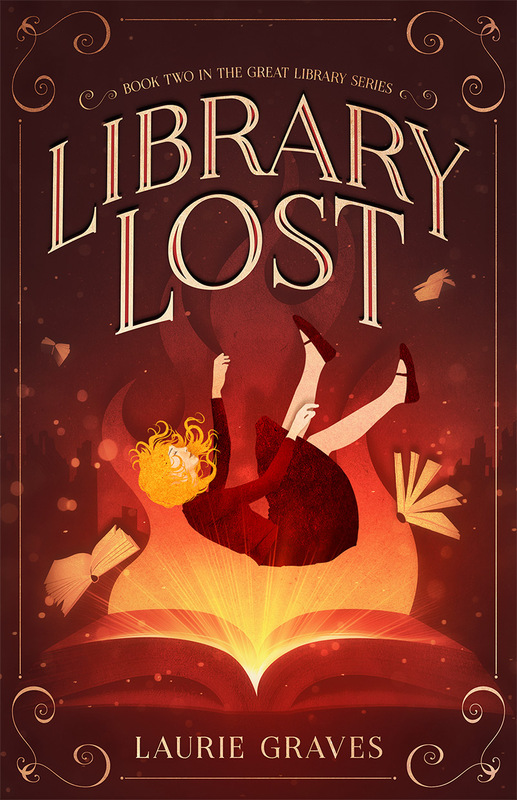 (This was a by-guess-and-by-golly type of thing. I just peeled and chopped potatoes and carrots until I had a goodly amount.) I added a cup of warm water and sprinkled salt, pepper, dried thyme, and sage over the vegetables. The chicken went on top, and I sprinkled more salt, pepper, thyme, and sage over it. I also minced a large clove of garlic and sprinkled that over the chicken. (Onion could be substituted for the garlic.) On went the cover, and voilà, in five hours cooked on high, we had a lovely chicken dinner. When it comes to vegetables cooked with chicken, Clif shows little restraint, and I knew that if I wanted enough potatoes and carrots for the following night, then I would have to Employ a Strategy. This I did, with biscuits, thus ensuring there would be plenty of vegetables for the casserole. After we were done eating, I poured the stock into a bowl and tucked it in the refrigerator. I also did this, of course, with the leftover chicken and vegetables. The next day, this casserole went together pretty darned fast. No, making a gravy from stock is not as quick as opening a can of cream of mushroom soup, but it doesn’t take that long, and it sure tastes better. I skimmed the chicken fat from the top. (Sorry schmaltz lovers, but I prefer butter. Must be the Franco in me.) In a saucepan, I heated the stock and strained it. In another saucepan, I melted four tablespoons of butter and whisked in four tablespoons of flour. 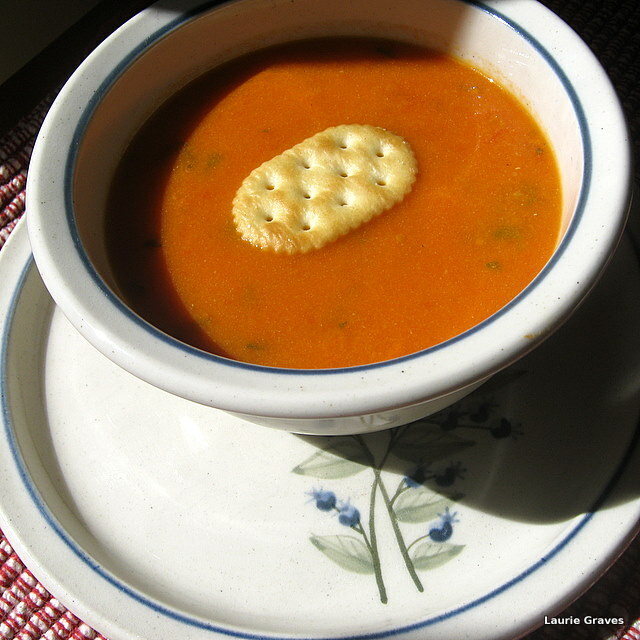 I poured in the hot stock, whisked and stirred, and within a few minutes, I had a delicious gravy for the casserole. A word about the tomato in this casserole. Initially, I wasn’t sure if I wanted one or not, but as I had a beautiful ripe tomato, courtesy of Farmer Kev, I decided to add it. I’m glad I did. 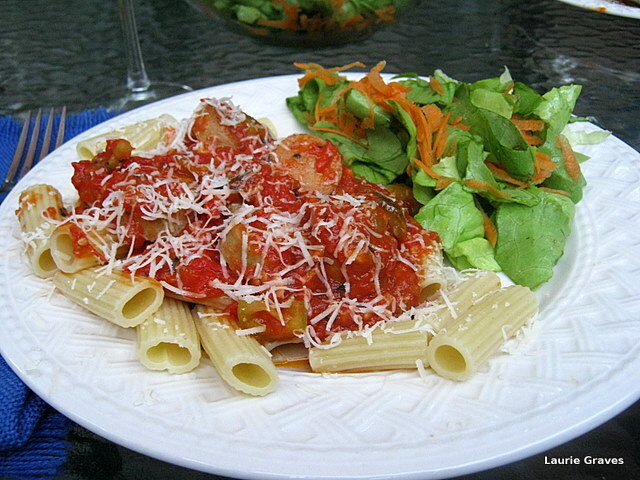 The acidic tomato added a pleasant tang to the smooth chicken, vegetables, and gravy mixture. When the fresh tomatoes have gone by and I make this casserole again, I will add a small can of diced tomatoes, drained. 1 large tomato, cut in chunks. Layer the chicken on the bottom of a large casserole dish. Put the potatoes and carrots on top of the chicken. Pour the gravy onto the casserole. Bake for 45 minutes or until the casserole is bubbling hot. Heat the stock in a large saucepan. In another large saucepan, melt 4 tablespoons of butter (or a combination of butter and chicken fat). Whisk in four tablespoons of flour and stir until the mixture bubbles a little. Pour the hot stock into the roux. Whisk and stir until thickened. The gravy will be done when it leaves a line on the back of a spoon. Thanks to the warm weather we’ve had this September, the tomatoes are coming in full force. For the past few weeks in my CSA share from Farmer Kev, there has been a generous allotment of tomatoes. I hate to play favorites, but I can’t help it. I love tomatoes, and I never come to resent them the way I do, say, greens or zucchini, both of which can seem like a curse rather than a blessing when they are coming in with such vigor that you wonder what in the world you are going to do with them. Not so with tomatoes. They can be eaten raw, which this time of year, is my favorite way of eating tomatoes. In fact for my lunch today, I had two poached eggs on top of two large slices of tomatoes. What a lovely, juicy mess. Tomatoes, of course, can be cooked down into a sauce. Or added to soups. Or a casserole, which I plan on doing next week when I make a chicken, carrot, potato, and tomato casserole, held together with a sauce made from the chicken drippings and topped with buttered bread crumbs. Bouquet garni—herbs tied in a bundle—is one of my favorite ways to use herbs with tiny leaves, such as thyme. All you do is clump the herbs together, wrap them with thread, and tie the bundle. Drop it into the soup stock, and let the herbs simmer with the onion and garlic. 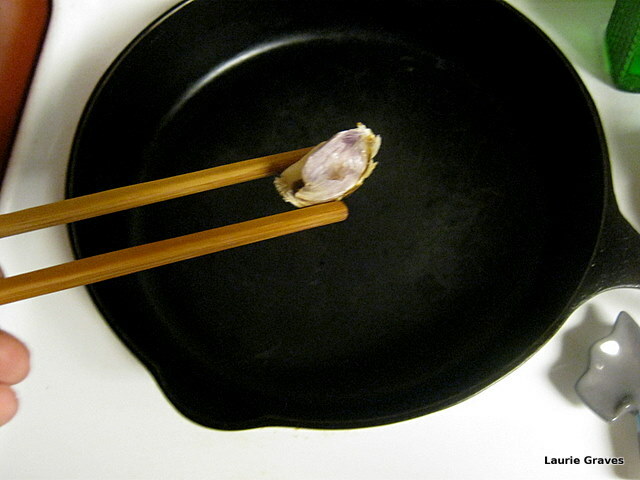 Then, when the simmering is done, use a slotted spoon to remove the garni. Voilà! You have the lovely infusion of the herbs without the tedious chore of plucking and chopping. However, I didn’t totally escape the chore of chopping herbs because after the soup was blended and a cup of milk was added, I finished the soup with fresh basil, which added another dimension to this already flavorful soup. Clif always likes soup to have “something” in it, and he duly added leftover macaroni to his bowl. Not me. I wanted to eat the soup just as it was—smooth, creamy, with the overtones of basil, and the undertones of the bouquet garni. Put the roasted tomatoes into a large stockpot. Yesterday, I groused about the extreme heat we’ve been having this September, but I must grudgingly admit that it is very pleasant to still be able to eat supper on the patio and to not wear either sweater or sweatshirt when doing so. This is especially true if you are eating roasted tomato sauce made with tomatoes you picked that very afternoon. Add sausage and peppers to the sauce. Spoon over the pasta of your choice. Serve with a salad made with lettuce and carrots from Farmer Kev’s garden. What more could you ask for? A glass of red wine? Why, yes, indeed. 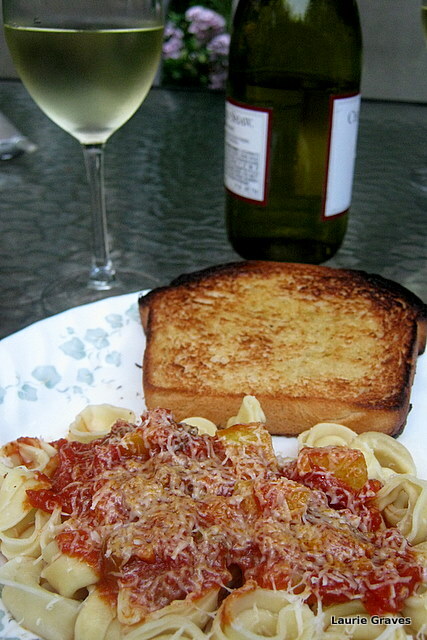 A meal like that, eaten outside on a warm night, certainly fits my idea of la dolce vita. That is high, high praise coming from my Yankee husband, whose usual comment is “pretty darned good.” Let’s just say that last night at the little house in the big woods, the cook was pretty darned happy. Now comes the big question: What to do with the skins and seeds? Neither Clif nor I mind the skin and seeds of Juliet, and I blend the roasted tomatoes just as they are. With larger tomatoes, I might remove the skins, but I would leave the seeds. For those who don’t like or can’t eat seeds, the sauce could be strained. I have loads of fresh oregano in my garden, and I sprinkle a generous amount of the herb, along with kosher salt, on the tomatoes before roasting. Dried oregano could be substituted, but in lesser amounts. After roasting, I blend the tomatoes in a food processor. The sauce is then sautéed with garlic and olive oil, and you could stop right there. However, last night, I added peppers and chicken sausage, but you could add zucchini or summer squash. Or onions. Or meat balls. Spoon the sauce over pasta or roasted eggplant. Or a thick, chewy bread. If it’s warm enough, eat outside. If not, eat inside. Either way, it’s la dolce vita when you have a sauce this good. Arrange racks in the oven so that one is in the middle and the other is above it. Wash the tomatoes, dry, and remove the stems. Cut them in half and put them in a large mixing bowl. Stir the 3 tablespoons of olive oil into the tomatoes. Place the tomatoes, cut side up, on 2 oiled baking sheets. Sprinkle with kosher salt and chopped oregano. Place baking sheets on racks and set timer for 20 minutes. When the timer goes off, switch the sheets so that the sheet on the top rack is in the middle, and the sheet on the middle rack is now on the top. Roast for another 20 minutes or until the tomatoes are very soft. Let the tomatoes cool on the baking sheets. When they are cool, scoop the tomatoes into a blender or food processor and blend into a sauce. In a large skillet, heat a tablespoon of olive oil. Sauté the peppers, sausage, and/or squash, if using. When the vegetables are soft, add the garlic and sauté for 30 seconds. Add the blended tomatoes. Serves 4 or 6, depending upon appetite. With all this fun, there hasn’t been much time for blogging, but I did want to slip in a recipe, as promised. 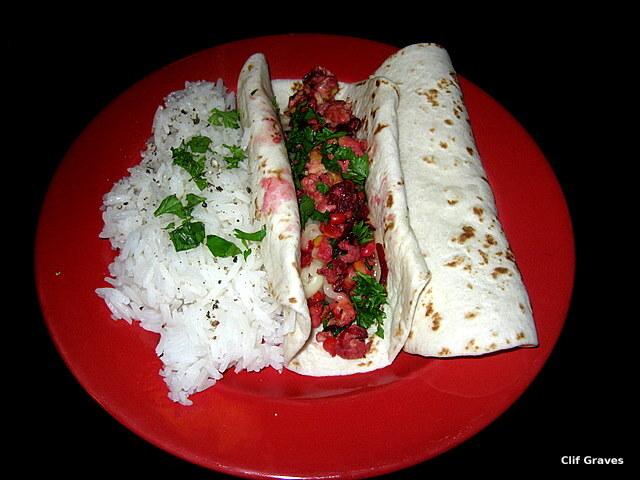 This week’s—a beet fajita—is a quick one that incorporates the egg technique used in the fried-rice recipe I posted a while back. That is, make a well in the center of the ingredients, pour in the beaten eggs, let the eggs set, scramble them, and blend them in with the rest of the ingredients, which have been sautéed until soft. Another good point about this recipe is that even if—ahem—beets are not your favorite vegetable, they are tasty prepared this way. These fajitas didn’t get a “pretty darned good” from Clif, but that is his highest praise reserved for only a few special dishes. The fajitas did, however, merit a “not too bad,” which means he liked it well enough to go back for seconds. Not too bad, indeed, for a husband who is not too fond of beets. Heat the oil in a skillet. 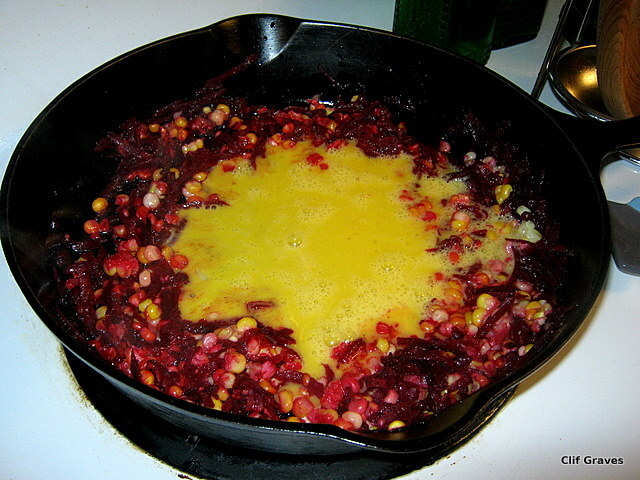 Add the corn and the grated beets and sauté until the beets are soft, about 5 minutes. Add the garlic and sauté for 30 seconds. Make a well in the center of the ingredients. Pour in the beaten egg, let set, and then scramble. 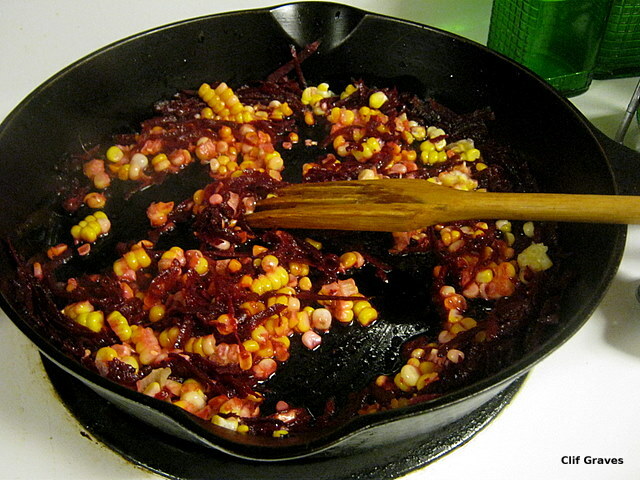 Once the egg is scrambled, mix it in with the beets, corn, and garlic. Warm the tortillas according to the directions on the package. 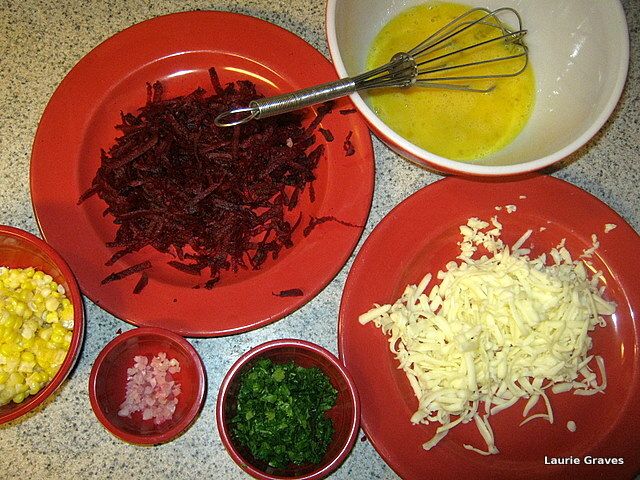 Spoon the beet mixture into the tortilla shells and top with grated cheese. Sprinkle with parsley, if using. Rice is a good side for this meal. All right. Here it is September 3, and yesterday the weather was so sweltering and humid that by mid-afternoon all I could hold in my mind was the next chore on my list—I just couldn’t think ahead—and it was so freaking hot that from time to time I had to wipe my sweating face with a cool wash cloth. Oh fall, where art thou? The leaves are starting to change, the apples are turning red, the goldenrod and asters are in bloom. It is dark by 8 p.m. But somehow, the weather doesn’t have enough sense to turn the page and follow the season. Temperature wise, despite all the signs of fall, we are in mid-summer. To a lifelong Mainer, is this very, very weird? You’d better believe it. But the larger problem, of course, is what to make for supper on a day when by late afternoon all you want to do is grab some ice water with lime, The New Yorker, and an apple and head to the patio. Supper is the last thing you want to think about. But even if you haven’t, this sauce is so easy to make—and like most of the food I cook—so versatile that even on a hot day it isn’t too much trouble. I used garlic, peppers, and summer squash. You could use onion, sausage, or ground beef. Or zucchini. Or eggplant. Or whatever combination you like. Get all the vegetables ready. For my sauce, I minced three cloves of garlic and cut one green pepper and one small summer squash in large chunks. In a skillet, I heated one tablespoon of olive oil and added the squash and peppers, sautéing them until they were just barely soft. I added the garlic and sautéed it for 30 seconds or so. Last came the tomatoes with basil. I turned the heat to low, covered the skillet, and let everything simmer for at least forty-five minutes. Add cooked pasta, and Voilà. Supper on a hot night. Clif and I took our plates out to the patio. A bottle of white wine came with us. As the dark settled over the backyard, we heard the crickets sing. In the dim woods, a pair of barred owls called to each other as they hunted, and Clif and I smiled as we listened to them. After that nice supper and a couple of glasses of wine, well, the hot day didn’t seem so bad. Nevertheless, fall can come anytime now. We are certainly ready.